If you're after an ice-cold beer on a steamy hot day, it won't come any more frosty than in popsicle form. The Organic Grill on First Avenue near St. Mark's Place has begun freezing its organic beer and sangria and serving the frozen treats to customers. 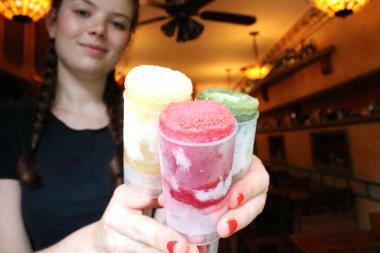 "I just had the idea because I never seen anyone sell beer popsicles or sangria popsicles before," owner Julia Chebotar, 25, of her "aha" moment this summer that led the restaurant to start selling the popsicles. 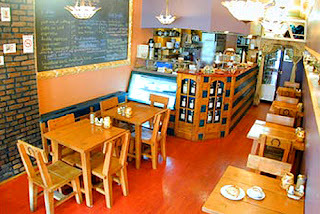 The Organic Grill, which serves mostly vegan and organic products for lunch, dinner and brunch, is a family-owned business that has been around for the past 13 years, Chebotar said. "The citrus lemon and lime brings out the beer flavor really well," she said. Chebotar's creation — clocking in at $3.99 for each 4-ounce treat — is a little more complicated than just freezing products in plastic containers with wooden sticks. "With our Samuel Smith lager I pair pineapple and lemon, and with the Pinkus Pilsner we pair raspberry and lime or strawberries," Chebotar said. The mix is then put in a blender with a hint of organic agave and raw cane sugar. For the sangria popsicles, the organic fruit soaks in red wine or rosé, which are also organic. "We have a red sangria with black berry, raspberry, peaches and orange," Chebotar explained. The organic rosé sangrai, from South African, is blended with prosecco, peaches, orange and pineapple, she added. There are also non-alcoholic versions featuring just juice and fruit. During the recent heat wave, dozens of restaurant-goers stopped in for the icy treats. "Customers love it," said Chebotar.